Mudra Stamps – Guest Designing! Welcome back to my blog. Today I am sharing couple of cards using the new Mudra Stamps. I am proud to say they are manufactured in India and of good quality. 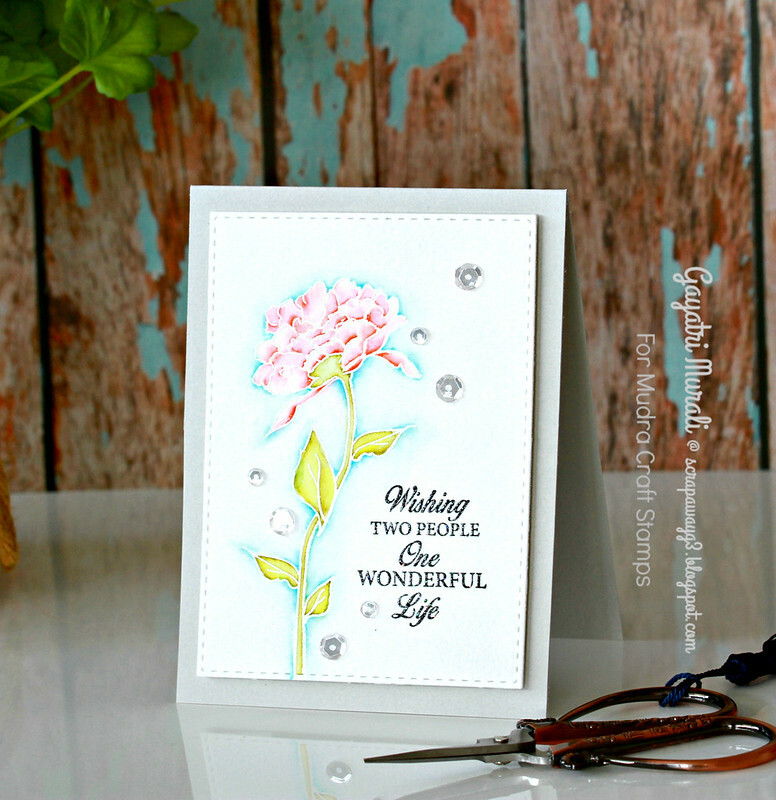 I am also thrilled that Varshitha invited me to guest design using couple of their new stamp sets. Thank you so much Varshitha for giving me the opportunity as well as your generosity. When the package arrived, I was curious to open and see the sets. When I did, the stamps smelled beautiful. Yes they are perfumed. And they are photopolymer not acrylic stamps. And they stamp well. They take ink well and gives even coverage. I am so happy with the quality. 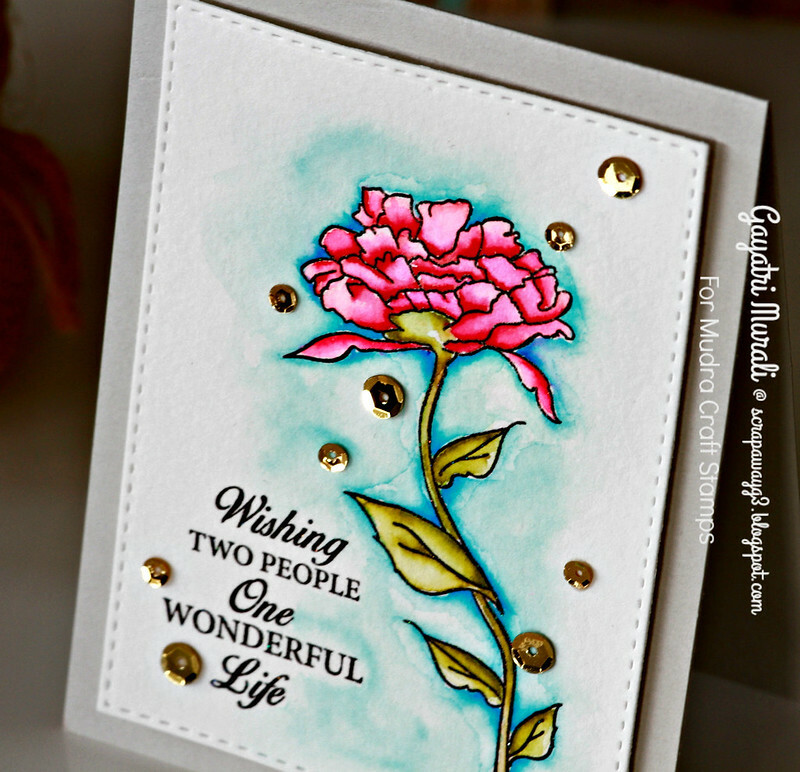 I am sharing with you couple of watercolour cards using one of the stamp set called Peony Love. 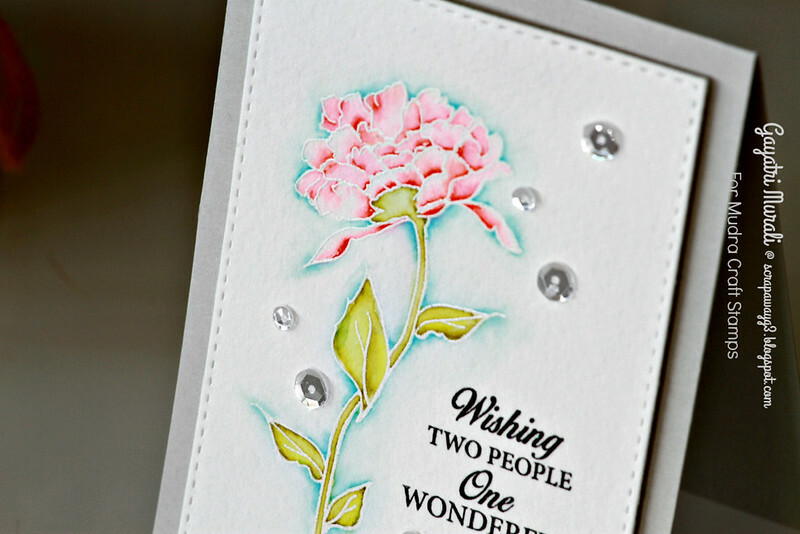 Over on Mudra Stamps Blog, I have couple of more cards using Peony Love as well as Let’s Party stamp set. Head over there to see them. Here is the Peony Love stamp set. I have used the flower with the stem to heat emboss in white and black to make two separate cards. I also watercoloured them using Zig Clean Brush pens. Being clear stamps, you can manipulate the stamp a little without damaging the stamp to get how you want the stem to bend. That is how I got them bend in two different directions on each of the card. I coloured the black embossed stem and flower with bold colours and the other pastel. Similarly the background. I stamped and heat embossed the same sentiment on both the cards. I then die cut both the watercolour panels with Stitched Rectangle die from Simon Says Stamp and adhered on Fog card base. Embellished with Pretty Pink Posh Sparkly Clear sequins. Here are the closeups. 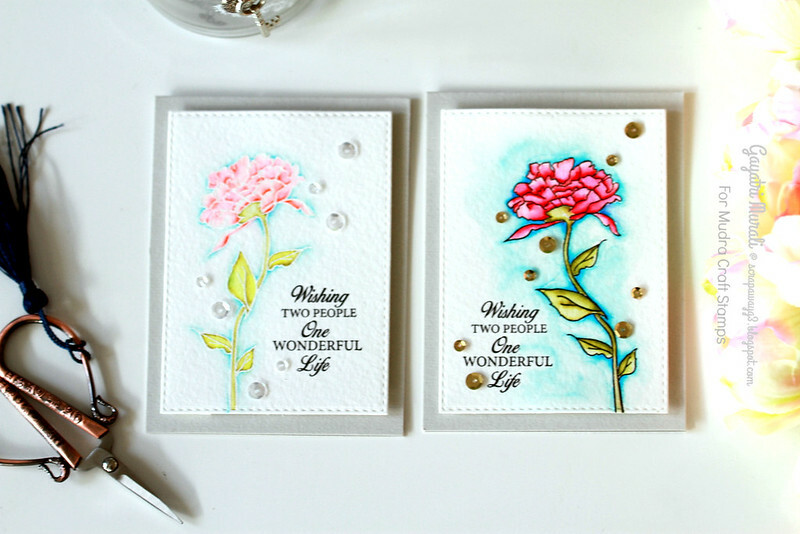 Love how you can get two different cards by changing just a couple of things – colour of heat embossing and hues of colour. Hope you are inspired and give the Mudra stamps a go. Absolutely awesome…As always so catchy and wonderful coloring!! This is absolutely amazing.. love the shades … and the White and Black EP you used to show difference is too cool… Lovely!!! Thanks a lot for wonderful Guest post!!! Beautiful cards! This is the first I've heard of Mudra stamps. I looked at them on Amazon and they're gorgeous! 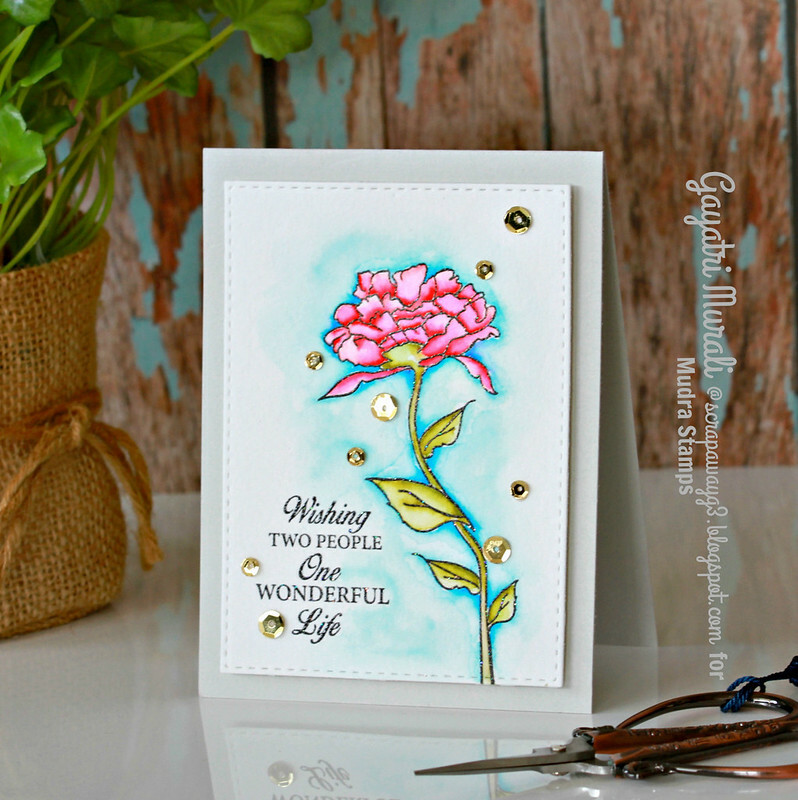 I especially liked 'so very Grateful' and hope that Mudra Stamps designs more like that! Thanks for sharing your talent. fabulous Gayatri. I really love that you have shown us two quite different designs with the same supplies.